This is the last installment of You Spoke, We Listened. We certainly hope you have enjoyed it. 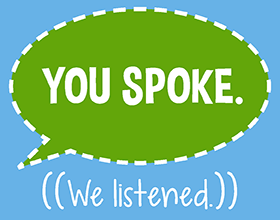 The Board and Staff of your Park District have certainly enjoyed listening, and have enjoyed responding to your recreational needs. Just because this is the last installment doesn’t mean we are no longer listening! Please keep sharing your ideas, thoughts, suggestions and even complaints. All communication is valuable, and the more the better. The more we hear about what is important to the community, the better we can serve you. Fill out evaluations after programs. It is emailed to all program participants, but you can also find it here. Use the contact us form on the website. Volunteer, either by yourself, or with a group. Request one of our naturalists to conduct a program for your club, school or group. Attend one of our focus group or neighborhood input meetings. Write, call (937-433-5155) or email! We can’t do everything each resident requests, but with your continual interaction and engagement, we can spot trends and patterns. From those, we can develop plans to deliver what most people seem to want. So far, thanks to all that you have told us, it seems to be working well. Happy Holidays to all, and remember to keep exploring your community’s BIG backyard!